Francis Galton was a pioneer of genetics and heredity (if you like him) or eugenics (if you don’t). He was also Charles Darwin’s cousin. Although Galton never worked at UCL, he was close to the institution, in particular as a close collaborator of Karl Pearson, the founder of UCL’s statistics department. Galton left his collections to the college on his death in 1911. He was unquestionably brilliant, but also a problematic figure, particularly by today’s standards. In his partial defence, the term ‘eugenics’ – which he coined – was far less loaded in his time than it is today. The depravity of the Third Reich was yet to come, and the worst abuses of European colonialism were not widely known. Both, of course, were rooted in the ‘scientific’ racism of eugenics. Moreover, things which are quite uncontroversial today, such as contraception, were considered to be part of eugenics. But for good reasons, he remains controversial. Galton was a polymath, working across disciplinary boundaries and making contributions to many areas of knowledge. 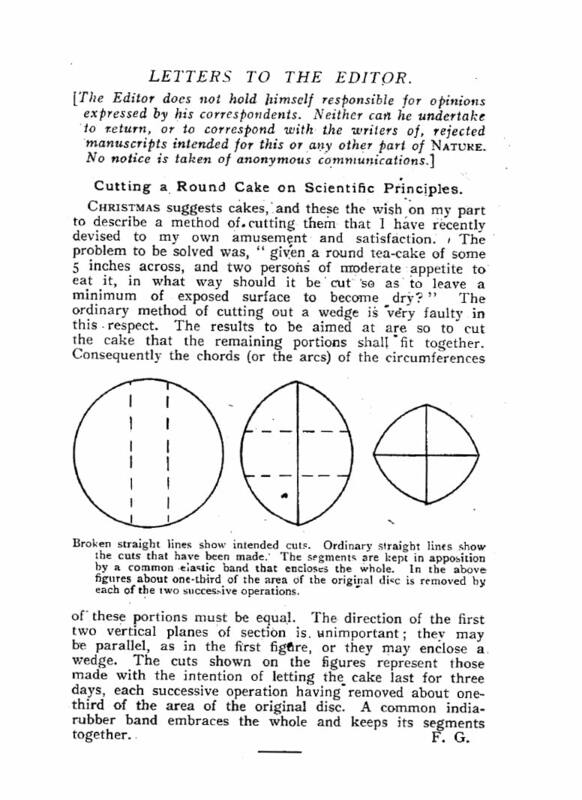 One of his more offbeat proposals is reproduced above: a letter to Nature, proposing a new and efficient way of cutting cakes, based on ‘scientific principles’. ‘Scientific principles’ in this case appear to mean avoiding the cut surfaces drying out, no matter how ridiculous the method turns out to be. Here at the UCL Science blog, we think his work on cake is like his work on heredity: historically interesting, but contentious. 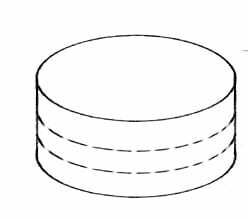 We would also like to propose a more efficient way of slicing a cake, which like Galton’s, avoids the surfaces drying out, but unlike Galton’s, requires no elastics and produces equally-sized and shaped slices: cut the cake horizontally. Tip of the hat to Prof Joe Cain.